"It is exciting to provide the first insight into such an elusive species," says Andrew Tilker, Ph.D. student at Leibniz-IZW and an associate conservation scientist at Global Wildlife Conservation. "Of course, this information is interesting from a scientific perspective, but more importantly it can help inform evidence-driven conservation initiatives. Our results provide exact locations for targeted snare removal efforts. We also establish the first conservation baseline for the species, which can be used to monitor population trends." 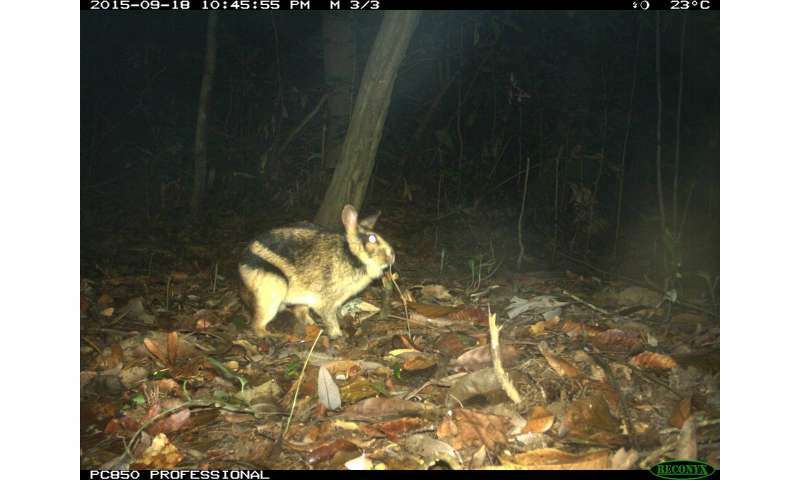 Dr. Ben Rawson, WWF-Vietnam's Conservation and Program Development Director, hopes that intensive efforts to halt snaring will result in rebounds in the Annamite striped rabbit populations. "With continued snare removal efforts in the Saola Nature Reserves led by WWF and our local partners, we are confident that this remarkable species can thrive." Francois Guegan, conservation director for WWF-Laos, notes: "We must act now to stop these threats and to provide effective protection to Palé. We have to work together, and we have to act fast. Otherwise we will lose the Annamite striped rabbit and other conservation-priority species from this site." "The Annamite striped rabbit is part of what makes the Annamites unique," says co-author Associate Professor Minh Le from Vietnam National University. "This study shows how fragile the species' survival is, even in protected areas." An Nguyen, Field Coordinator for the Leibniz-IZW project, agrees. "The species is hanging on – but for how much longer? We need to improve law enforcement, stop snaring, and reduce the demand for bush-meat. One organization alone cannot do this. We need to work together – if the Annamite striped rabbit is to survive."